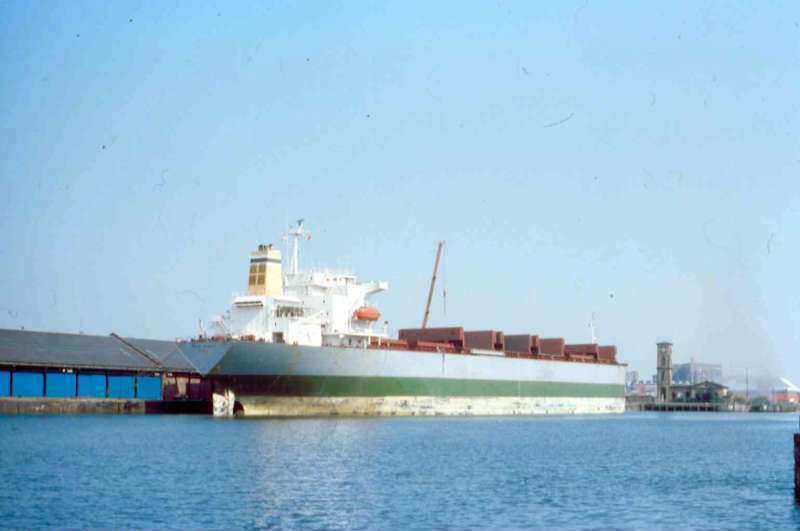 IRISH SPRUCE was a 75000dwt Panamax bulker built at Cork for Irish Shipping in the early/mid-1970s. In 1984 she came upriver to Glasgow for repairs and was one of the largest ships to be repaired in the Glasgow dock system. This is her berthed at Yorkhill Quay. I remember her on the Slipway in Verolme dockyard. Yard number 988.She was the Penultimate vessel built there, if not the most troublesome. Stories of plant being fitted the wrong way around to delay the process while the yard waited for further orders that never came.Meanwhile, unions were demanding £200 a week for their workers. This was back in 1982.There was a very interesting book about the building of Her and other ships at that yard, that was brought out last year, Written by the Yards former Chief Naval Architect. Paul, that completely fits with my information that she was arrested while undergoing repairs on the Clyde and stayed while agreement was reached with her mortgagees to allow her to be sailed to Marseille and laid up there. At that time the Irish Government was negociating with the Japanese part of the ownership consortium to buy out the mortgage but the deal never came off. Not surprising really as she was so overpriced when built that they could have bought a brand new ship for less than the mortgage on the "Spruce". Thanks again, Alastair. I think the wrangle started when she was repairing on the Clyde because I seem to remember she stayed for quite a while and now you mention it, I think she possibly sailed for France. This ship had a very interesting legal history. She was built in the Cork shipyard at a cost vastly in excess of world prices against the better judgement of the company's managers. This was a political decision to try and maintain employment at the yard and was funded largely by the Irish Government, (who founded Irish Shipping in 1941 and owned it), with 24% of the cost being funded by a Japanese consortium. The Irish Spruce was never owned by Irish Shipping Limited; it was leased by the company from the owners Jura Shipping Limited and the lease payments were guaranteed by the Irish Minister for Finance. The Irish Government put Irish Shipping into liquidation in 1984 and it's remaing ships, including the Spruce, were arrested one by one during that year. Because of the complex legal tangle over the vessel's ownership she was taken to Marseilles and sat there while her future was argued over. The cost of the care and maintenance of the Irish Spruce while it was berthed at Marseilles was approximately £34,000 per week. These costs include port charges, victualling and so on in addition to crewing costs and were borne by the Irish Government. 17 June, 1986, The Irish Spruce was sold by public auction on foot of a court action brought by the holders of the ship's mortgage against its owners. The price obtained at the court auction was $5.0 million for her, a bargain for someone even as scrap! I don't know who bought her at auction. This photo has been shown 4,464 times since it was added to the site.